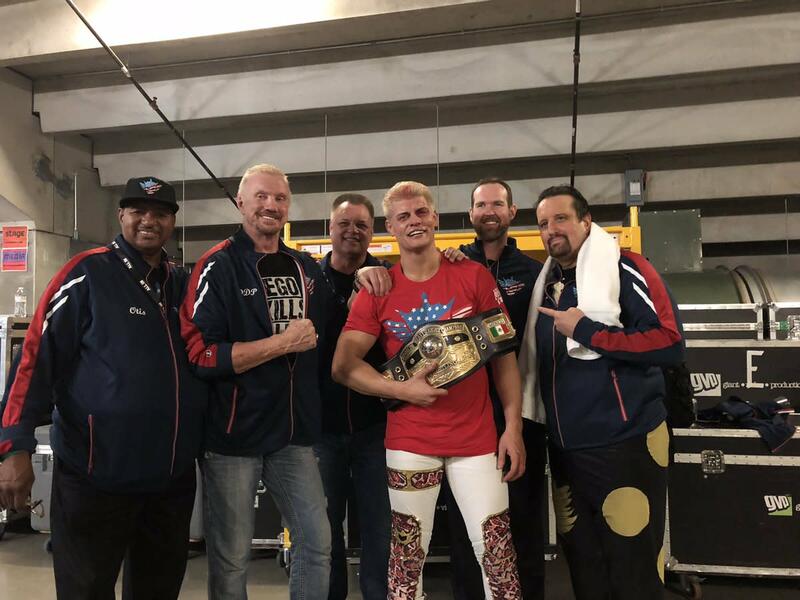 His father held the title three times, and Cody will have at least one reign with the NWA Worlds Heavyweight Championship. Cody defeated Nick Aldis at All In to become the new NWA Champion. The finish was Aldis going for a sunset flip, with Cody collapsing on it and hooking Aldis' legs to get the pin. Part of the story for the match was Cody bleeding when Aldis hit him with an elbow when Cody was going for a springboard move to the outside. Aldis went for an elbow drop from the top rope towards the end of the match, but Brandi Rhodes covered Cody and took the brunt of the move. Cody's title win comes in advance of the NWA's 70th Anniversary Show in Nashville, Tennessee on October 21. Cody is the third person to hold the NWA title in the Billy Corgan era, joining Aldis and Tim Storm. Aldis had held the championship since defeating Storm in December 2017. The NWA title will be defended in the main event of the 70th Anniversary Show.